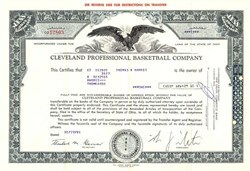 Beautiful certificate from the Cleveland Professional Basketball Company issued in 1981. This historic document was printed by Judson Brooks Banknote Company and has an ornate border around it with a vignette of an eagle. This item has the printed signatures of the Company's President and Secretary and is over 27 years old. This is only the second time we have had an issued certificate from this company. Tri folded for storage. The Cleveland Cavaliers joined the NBA for the 1970-71 season. A franchise that has known its share of ups and downs, the Cavaliers have scraped the bottom of the barrel at times, both on and off the court. Still, after struggling through much of its first two decades of existence, Cleveland turned itself around in the late 1980s to become a consistent Central Division contender. The Cavs joined the league as part of an expansion that also included the Portland Trail Blazers and the Buffalo Braves. Expansion forced the NBA to realign into two conferences, with two divisions in each. The Cavs were put in the Central Division along with the Baltimore Bullets, the Atlanta Hawks and the Cincinnati Royals. 1970-71: A Less Than Memorable Debut The first-year Cavaliers were a motley crew, even by expansion team standards. Coach Bill Fitch, who had been hired away from the University of Minnesota, had his work cut out for him. The cast of characters included Luther Rackley, Johnny Egan, Len Chappell, Larry Mikan (son of NBA great George Mikan), and Gary Suiter. The team's regulars were Walt Wesley, first-round draft pick John Johnson, Bobby "Bingo" Smith, and John Warren. After looking over the team, Fitch was reported to have said, "Just remember, the name is Fitch, not Houdini." Cleveland entered the league with a thud. The squad played its first seven games on the road because the Cleveland Arena had been booked by the Ice Capades. The team dropped all seven outings by an average of 17.3 points per game. Fitch may not have been amused, but he was amusing. "We're the only team who could play back-to-back games on What's My Line and stump the panel," he told the press. "Mission Impossible didn't even want us on their show." The Cavaliers finally got to play in Cleveland and lost their home opener on October 30 to the San Diego Rockets, 110-99, before 9,119 spectators. The losses continued to mount, but Fitch's sense of humor didn't flag. "I phoned Dial-a-Prayer, but when they found out who it was, they hung up," he quipped. The losing streak ran to 15 games before the Cavaliers finally posted their first victory by beating the expansion Trail Blazers, 105-103, in Portland. The Cleveland squad promptly dropped a dozen more before the schedule gave the players a home-game crack at Buffalo, the third expansion team. Cleveland beat the Braves by a single bucket before only 2,002 fans to claim the franchise's first home victory. The rest of the season continued in a similar vein. The club was 2-34 at one point and stood at 3-36 before engineering a three-game winning streak with victories on December 25, 26, and 27. Cleveland reached its nadir for the season when guard John Warren, in a game against Portland, converted a layup into the opposing team's basket. But Portland wasn't faring much better-Trail Blazers center LeRoy Ellis tried to block Warren's shot. The final tally for the first season was 15-67. The only thing the Cleveland faithful had to cheer about was rookie John Johnson, who earned a spot in the NBA All-Star Game on his way to a fine first campaign in which he averaged 16.6 points. The team struggled at the box office, as well. A four-game home stand in early January drew a total of 13,214 fans, and on three occasions fewer than 2,000 people showed up to watch the action.